When the Halifax startup Proposify wanted to tell the world how it had grown in 2015, it put out a press release with some pretty gaudy numbers. Monthly recurring revenue, or MRR, rose 1500 percent to $66,517. Paid customers increased 746 percent to 1,617. The staff doubled to eight. Proposify is an example of a recent trend in the Atlantic Canadian startup community – scaling companies. There was a baby boom in the East Coast startup world for the past few years with a lot of young companies forming, and now some of those youngsters are hitting a growth spurt. They’re gaining customers, hiring staff, and exporting products around the world. They are the focus of our latest Entrevestor Intelligence report, which we've published online today. This growth is great for the companies themselves, their staff and their investors. It also has a massive economic benefit. All the people who have invested so much blood, sweat, toil and tears in the startup community in the last five years did so with the vision of creating an innovative economy on the East Coast. In order for that community of innovators to really have an impact on the broader economy, some of the startups have to grow into bona fide corporations. That’s beginning to happen across the region. It’s not happening with ease, and there are still plenty of challenges. But the seeds have been planted and shoots are appearing. Now several organizations are beginning to formulate ways to help established companies scale. For example, the regional accelerator Propel ICT is working on a program for scaling companies. Milbury refers frequently to the need for more “gazelles” in the regional economy. While “unicorns” are known to be high-growth companies with a billion-dollar valuation, gazelles are a slightly less well known species though no less important. Gazelles are companies of any size that are growing revenues by at least 20 percent per year over four years. It may be hard to find many of these companies in Atlantic Canada simply because not many of our startups have four years of revenue history. But there have been more frequent sightings. Though it’s difficult to get public statements on revenue growth, there is evidence of these companies blossoming. Halifax-based STI Technologies, for example, which helps pharma companies distribute samples, was named to the Deloitte Fast 50 last year when it revealed revenue growth of 204 percent over four years. That placed it 41st on Deloitte’s annual tally of the fastest-growing companies in Canada. St. John’s-based financial technology company Verafin said last year that its revenues in 2014 had grown 45 percent, and that its compound annual growth rate in 2012-2014 had been 51 percent. Last autumn, Dartmouth-based multi-channel marketing company SimplyCast said its third-quarter 2015 sales increased 105 percent from the same period a year earlier, and that it experienced a 99 percent retention rate among its customers. These companies are by no means alone. Entrevestor estimated that at the end of 2014 there were about 80 Atlantic Canadian companies that had more than $100,000 in annual revenue and sales growth of 30 percent a year or more. By the end of 2015, the figure was probably closer to 100 companies. The goal of Milbury and other people throughout the ecosystem is to keep these companies growing and scale them into major companies headquartered in the region. And coming up with programs to support such growth isn’t easy. It’s one thing for public agencies or government agencies to devise programs to give seed funding to companies; it’s riskier, more expensive and harder to sell to the public programs to help medium-sized companies grow into big companies. And at the end of the day, good companies will have to figure out how to scale on their own. “The ecosystem itself is at the point where the companies are facing all these scaling issues,” said Dawn Umlah, Entrepreneur-in-Residence at Innovacorp. She said the big issue a lot of companies are facing is what she refers to as “operational debt”. Essentially, that is the weaknesses in a company’s structure or organization that creep into the business as it grows. They have to be addressed before the company grows further, and the process of removing operational debt can be painful. As a hypothetical example of the problem, she said a company might not have an individual who understands strong sales processes. The company might hire a seasoned sales leader, but that person may end up reporting to one of the founders, who still doesn’t understand fully how sales work. The company therefore has to adjust to make sure the expertise of the new person permeates the company culture. Governance and leadership – While NBIF wants to help startup founders progress into executives, it also wants stronger governance. Research has shown that companies with boards of directors outperform those without boards. Some founders resist establishing boards, but NBIF and others in the community say boards can extend a company’s reach and talent pool. “Think about it as a great situation that you cannot do without,” said Daniella DeGrace, CEO of Gemba Software Solutions, at the Moncton event. Sales – Most startups have a few customers or early adopters. But to scale, companies need to master modern sales products. For business-to-consumer SaaS products, the companies need to learn the methods to get their product to millions of clients and to measure and amplify the things people pay for. For enterprise products, companies need to learn how to develop and execute on a sales funnel. They may have to open sales offices close to their customers. Capital – NBIF has a ceiling of investing up to $1 million in each company, and will in rare exceptions increase that ceiling. The real change in its funding strategy is that the foundation is now willing to take a lead role in A and B rounds. Whereas it previously would join follow-on rounds led by larger partners, NBIF now could write the term sheets itself so the target company could show other funders an offer on the table. Across Atlantic Canada, throughout the spring of 2016, more and more companies have been bringing in million-dollar-plus financing deals. As of press time for this publication, this amounted to almost $13 million in equity investment, most of it coming from private sources. At Entrevestor, we hear of deals coming down the pipe, and through the summer there will be more significant deals announced by scaling companies. 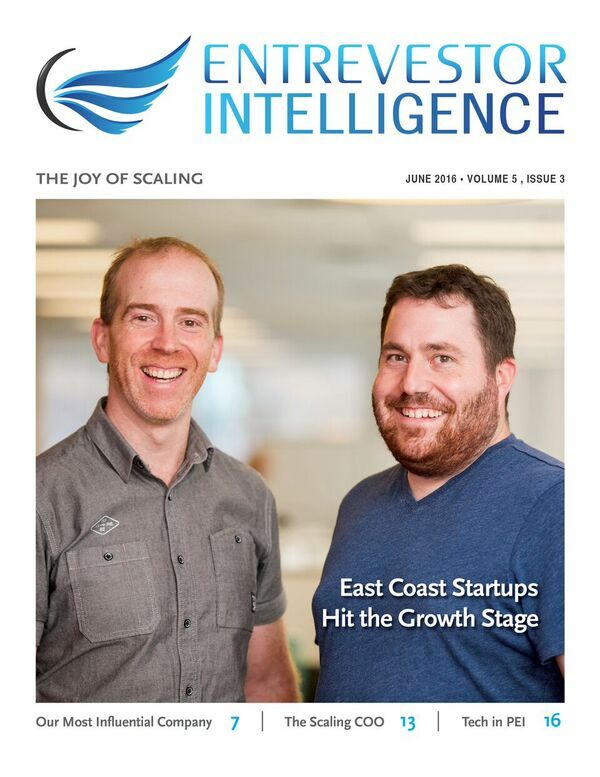 This issue of Entrevestor Intelligence examines trends in scaling companies. We profile a few that are gaining revenues or hiring staff. We look at the burgeoning communities in St. John’s and Charlottetown. And we profile the granddaddy of the Atlantic tech companies, Mariner Partners of Saint John. We’re doing this now because scaling is the most important issue facing our community.